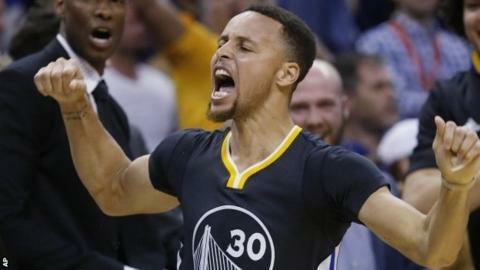 Stephen Curry's record-breaking season in the NBA continued on Saturday as he beat his own single-season best of 286 three-point baskets with 24 games left. It was his 12th three-point shot of the game, tying Donyell Marshall and Kobe Bryant's NBA single-game record. Curry scored 46 points as Golden State's win secured a play-off place. He tweaked his ankle in the third quarter but had it taped up in the locker room and returned to lead the Warriors to victory, making 12 of the 16 three-point shots he attempted to take his record to 288. "I got a good rhythm dribbling up and found a good spot to take off from," Curry said. "I had confidence all night. Thankfully that last one went in when we had a chance to win the game."